Israel’s Water Authority and its Ministry of Energy have sketched a plan to build a tunnel that will annually pump between 300 million and 500 million cubic meters of desalinated water to the receding Sea of Galilee, two people familiar with the matter who spoke on condition of anonymity told Calcalist. To finance the plan, estimated to cost NIS 5 billion (approximately $1.3 billion), Israel has approached the European Union and the German government, with negotiations being handled by Giora Eiland, an Israeli Major General (ret.) and a former head of the Israeli National Security Council, the two people said. Despite successful desalination and wastewater recycling efforts, in the past four years, Israel has been facing water shortages caused by a long drought. In May, the Israeli government relaunched a television, radio and billboard campaign encouraging Israelis to save water by reducing their shower time by two minutes, watering their gardens in the evening and fixing leaking pipes. The planned tunnel will connect nearby desalination factories with the Sea of Galilee, the people familiar with the matter said. An exact route for the tunnel has yet to be determined, they said. As of Monday, the water level of the Sea of Galilee, responsible for 25% of Israel’s freshwater supply, is at 214.23 meters below sea level, 1.23 meters under the levels defined by the Israeli government as a minimum required to supply the country’s water needs. 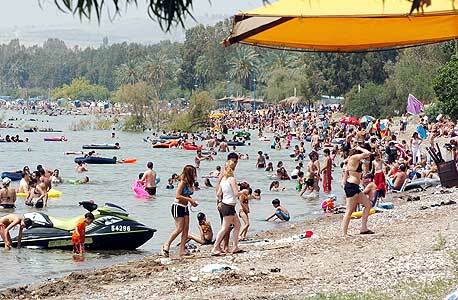 “To prevent further decline in the water levels of the Sea of Galilee, the continuation of which damages the water quality and puts the lake at risk, the Water Authority is setting up a system that will pour water into the lake,” a spokesperson for the Water Authority told Calcalist in a message Sunday. According to the Water Authority’s data, 1.6 million cubic meters poured into the Sea of Galilee equal a 1 cm rise in its level. Current pumping technologies will become unviable if the water level goes under 215.5 meters below sea level, according to the Israeli Ministry of Environmental Protection. The lake was at an all-time low in 2001 at 214.87 meters below sea level. Giora Shaham, general manager of the Water Authority, said in a phone interview with Calcalist Sunday that Israel must take action to preserve the Sea of Galilee, declining to supply further details. In reply to Calcalist’s response for comment, Israel’s Ministry of Energy said that the matter is currently being examined and it will be able to respond after this process ends. Approached by Calcalist on Sunday, Eiland said he has been in touch with German agents concerning Israel’s water crisis. “Germany is very concerned by the state of water in the Middle East since it is one of the main causes for immigration to Europe from the region,” he said. Eiland did not comment on the plan.